Author: Pither Medjo Mvé. Edited by: Wilhelm J.G. Möhlig, Bernd Heine. 12 pp. Roman, 208 pp. The Koya (Bakoya) are a so far little known hunter-gatherer community living in the Mékambo region of Gabon. They speak a Bantu language subsumed under Guthrie’s zone B.22b. This book presents the results of an ethno-linguistic field research, carried out by the author in 2005. The work contains three major sections. 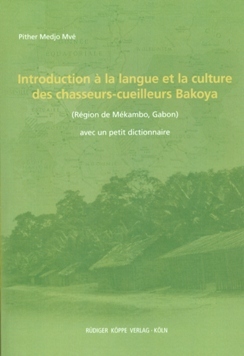 The first section comprising seven chapters deals with the history of Bakoya migrations, the geographical position of the Bakoya people and their ethnolinguistic relations to neighbouring languages. After an introduction into the sound and tone systems and the nominal class system of this Bantu language, the author discusses its classificatory position and integration into zone B.22b. Logistic and methodological questions in relation with his research of 2005 are described in chapter 7. The second and third sections contain Koya-French respectively French-Koya wordlists of more than 1,000 key entries each. The material is classified as to linguistic categories and to singular-plural formation. Where applicable, cross references are given. At the end of this pilot study, the reader will find a list of 189 Koya lexical items that are related in their majority to Guthrie’s Common Bantu Index of 1971 (by the author called Proto Bantu) and partly to Meeussen’s Bantu Lexical Reconstructions of 1969.